Venturing into a second act or a new career isn’t easy. But follow a few of these motivating tips and you just might take the first step. 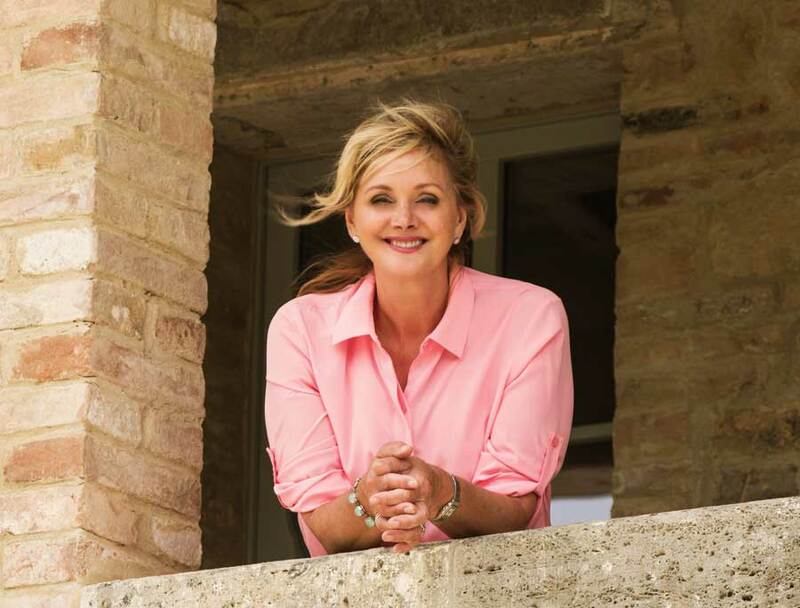 Debbie Travis is no stranger to telling people what to do – with regards to home design and decor, that is. The self-made lifestyle expert and television personality – you’ll recall Debbie Travis’ Painted House and Debbie Travis’ Facelift – has also written eight books on decorating, all while maintaining her small business entrepreneurship. 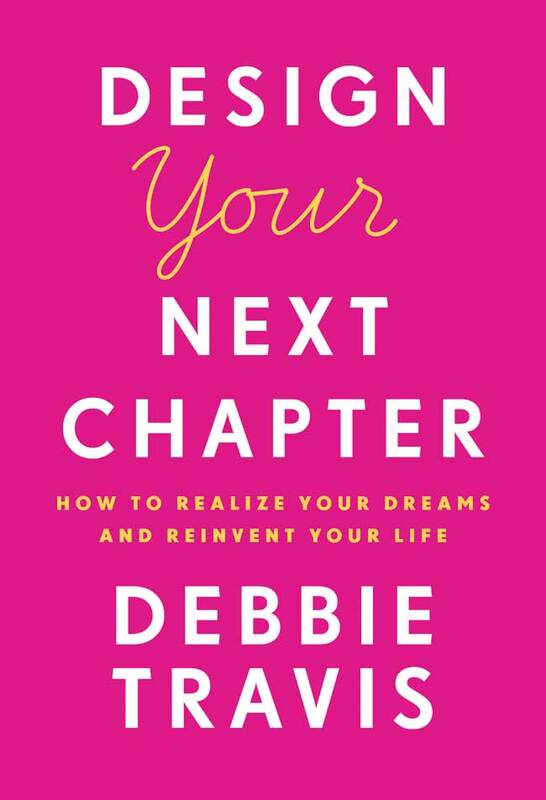 Now, Travis has decided it’s time to tell us “how to realize your dreams and reinvent your life,” with her latest book, Design Your Next Chapter. And it has nothing to do with decor. Realizing that it’s not all tossing a throw pillow here and a splash of paint there, the mother of two pushed herself to make a change a few years ago that would allow her to spend more time with friends and family; the things that make her happiest. 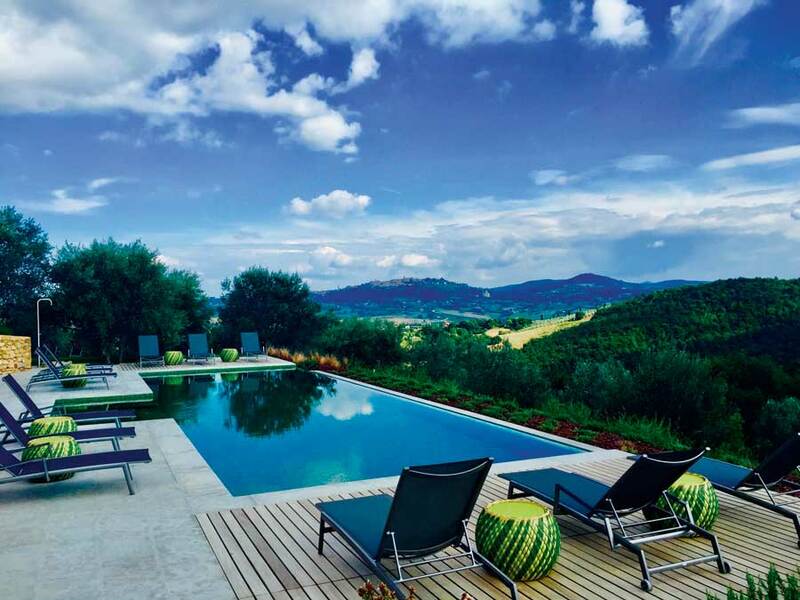 To achieve that goal, Travis bought and transformed a 13th-century farmhouse in Tuscany in Italy into Villa Reniella, a hotel and retreat for women — her “Girls’ Getaway” — that also offers Mind and Body weeks and gourmet weeks for both men and women. 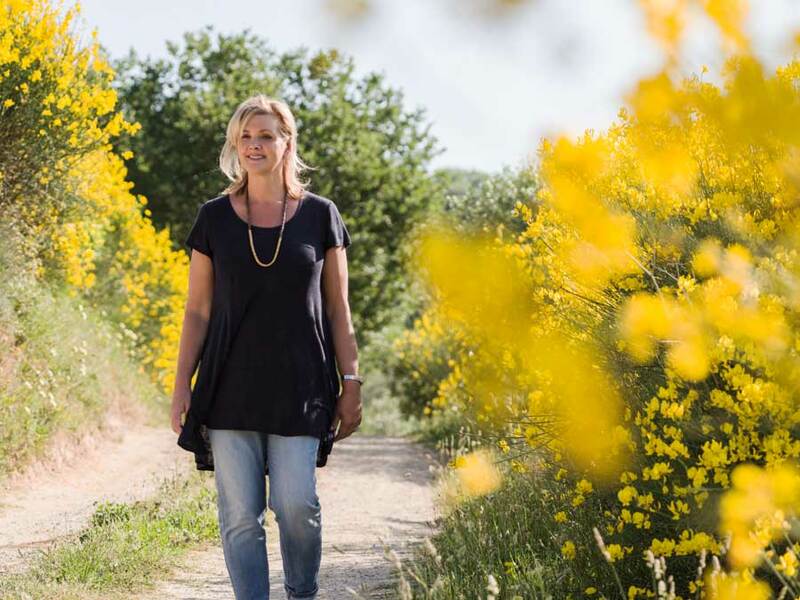 Speaking of gourmet, the 100-acre farm surrounding the property also allows her to produce extra virgin olive oil and lavender. With Design Your Next Chapter, Travis has devised a road map to taking the next step into the new based on her own experiences. From navigating U-turns to coming up with seven ways to find your passion (wake your inner child, find your inspiration and how to say yes count among them) to, yes, really designing that next life chapter — plot, plan, practise, research and don’t be afraid to demolish, clear out or salvage what needs be. Need more inspiration? Travis’s 10 commandments strike a chord, in which she argues to dump the excuses, embrace mistakes and stay enthusiastic, among the list. But perhaps the most difficult thing for us is simply taking the first step. Here, Travis shares her No. 1 commandment. Fear of the unknown, fear of trying something new — fear of any form of change — is familiar to us all. Finding yourself at a crossroads can be mindnumbingly scary, but let’s put fear into perspective. Real fear can disable us, halt us in our tracks. It can also spur us into action. If you wandered into your backyard and were met by a roaring lion, you might freeze for a moment, but then the fear would propel you to leg it out of there before you got eaten! That’s real fear. Real fear is also that gut-wrenching physical dread that engulfs you when you have a seriously sick child. Or when you fall way behind on your rent or your mortgage and face losing your home. Or when a dark chill of emotion alerts you to the fact that your partner is having an affair and your relationship is probably over. Fear is having no control. If the bank is threatening foreclosure, fear will keep you up at night until you find a way to control the situation. You can help your sick child feel more comfortable, but his recovery is in the hands of the gods and in the hands of the doctors, not yours. You also can’t control whether your partner will betray you. Fear on this level will overwhelm you for a while, but eventually it will be replaced by a slew of other emotions. Fear is crippling. If we are ruled by our fears, we find it impossible to move forward. So let’s not call the emotion you feel when you are challenging yourself to commit to a new chapter in your life fear. Let’s describe it, instead, with more manageable words: you’re anxious, you’re worried, you’re uncertain. That’s nothing to be scared of! There is nothing truly frightening about taking a different path when your job feels like a constant Groundhog Day or when being alone after a divorce or widowhood seems unbearable or when you’re rattling around an empty house after the kids have moved on. It would be more frightening for you in the long term to remain stuck in that place. Instead, try to view your anxiety about change as totally normal. Remember that uncomfortable emotions help create the energy we need to change. We need to be cautious, of course, so make sure you stop to check that there are no obvious boulders in your way when you leap. But don’t let your niggling worries stop you. If you’re caught between a gut feeling that this move is really right for you and the fear that it all could go wrong, I recommend you always believe in your gut feeling. For me, the best tool at this stage is pen and paper. The technique I suggested for finding your new dream is a good plan here, too: write stuff down. First, make a list of everything that is holding you back from creating your next chapter. Second, make a list of everything you feel positive and excited about with regard to this new phase in your life. Lay the two lists side by side. I can guarantee that at first your list of negatives will be very long and your list of positives quite short, even dinky. But take a hard look at those negatives, and start to differentiate between what is a true problem — something you have little or no control over — and what is an excuse. “It’s just not a good time” is an excuse. But “My husband is very sick” means it probably is the wrong time to embark on something new. “I can’t afford to make this happen” is a problem, but the kind of problem that likely has a solution. Start working on how you can solve that one, bit by bit. As you cross out the excuses, your negative list will get shorter and your positive list will begin to grow. To demonstrate the kind of list I’m recommending, I asked my sister-in-law to share her “fear” list. Though Sian has been divorced from my brother for over 12 years, we’re very close and I adore my two nieces, Sian’s daughters. One of them has just left for university in the U.K., leaving her mother and sister behind in New York. Sian’s other daughter will soon head out to her college of choice. • Fear of who I am apart from being an everyday mom. My daughters have been my main purpose in life. My focus, my drive, has been on their well-being and their futures. With them gone, I have lost my identity. • Fear of living alone without family. Once the girls leave home, the closest family to me lives an ocean away in the U.K.
• I am fearful that now I’m in my 40s, I’m too old to start something new. • I am afraid about money and security. • What will motivate me to get through the day when I don’t have to take care of my daughters? • What will give me the kind of unconditional happiness I find with the children? • Will life ever be full again? • I am terrified of the unknown. Every item on Sian’s list is completely understandable. But let’s try to put each one into perspective and think about how she can lose that fear. Which ones are unlikely to change because she has no control? Which of them, no matter how troubling they feel, are excuses? Her angst about money and security is a problem, but she can potentially solve that one by seeking professional guidance to plan for her future. The rest are normal vulnerabilities that she can banish by being more flexible about her circumstances. She needs to make herself, not her daughters, the centre of her life now. Once she figures out how to do this, she will find out the world is still full of possibilities. Sian is certainly not alone in worrying about what comes next after a significant passage of one’s life is over. It took me a long time to adapt to the intense quiet in the house after both my sons had moved out. They do return often and the house immediately fills with their spirit, but it feels different now. Still, if you are awake to the possibilities, new doors always open. Sometimes literally. After years of searching, Hans and I finally arrived at an ancient, wooden door fitted into an even older stone wall in the heart of Florence. We rang the rusty bell under the sign that declared that this was the office of Livio Garavaldi, notary at law. Thirty minutes later we walked out waving the deed to a pile of stone on a hundred-acre olive farm in the heart of Tuscany. We grinned at each other through lunch, smiled stupidly through our aperitivi and exulted more over dinner. But later, at 3 a.m., that crazy hour of doubt, both of us were wide awake in bed in our musty B&B wondering what the heck we had done. At that godforsaken hour, our romantic move felt both stupid and overwhelming. But it was too late to back out — the money had been transferred to the former owners of the property and, for better or for worse, we were now the new proprietors. The first time Hans “abandoned” me in Italy to go home and keep our business running, I stood forlornly in the muddy courtyard to wave him off. I felt lonely and pathetic and incompetent. Those feelings only got worse as I struggled daily trying to make myself understood by the builders. They were kind and skilled and had renovated these types of medieval buildings numerous times before. I knew I was in good hands but I was still scared. I had no choice but to conquer the fear, which meant doing my homework and trying to learn Italian while I took on the largest project of my life. My two sons’ straightforward advice always rebooted me when I was engulfed in doubt. “Not like this,” I grumbled. Transforming a hundred-acre estate on a hillside abroad is a far cry from redoing a guest bedroom in someone else’s suburban house for a television show. Kids have the magic touch. They bring us back to reality with a laugh and help us conquer the fear. Excerpted from Design Your Next Chapter by Debbie Travis. Copyright © 2018 Debbie Travis. Published by Random House Canada, a division of Penguin Random House Canada Limited. Reproduced by arrangement with the Publisher. All rights reserved.